To create a quick and easy way for citizens to open a dialogue with their municipal government and discuss issues. 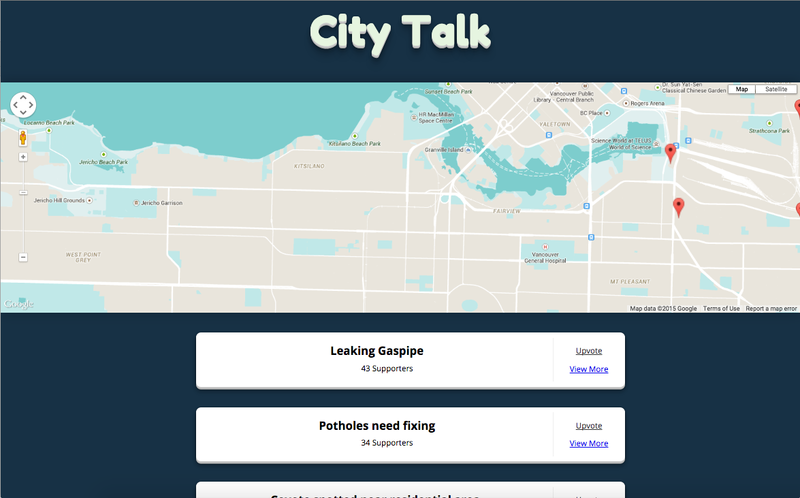 For this hackathon, we made a webapp called City Talk. The problem we want to solve is to improve the communications between citizens and city officials as well as provide a platform for discussing specific issues citizens might have. Currently, you'd call 311, or you go online and go through a complicated process to report an issue. Discussing problems within the neighbourhood may also be a lengthy process, sometimes we simply dont have the time. The current system isn't as effortless and engaging as it can be and There is no immediate feedback. City Talk solves these problems. What we have is a simple, and easy to use interface where a user can go on the site, have their location automatically centered on a map. Pins on the map represent issues around their area, the top 5 of these issues are listed below. They can range from the usual things, to long-term, large scale recommendations you may have for the city. We decided on this large range in order to engage the widest audience possible. The idea is to encourage people to start using the system to report small issues that could be helpful if your local MP would know and move on to supporting or being a part of larger city-wide initiatives in the future. We've adopted a bottom-up approach were it's the citizens who propose new ideas and raise issues and it's the city's job to respond to them. If they identify with an issue listed, they can upvote it and also view and join the discussion. Otherwise, they can create their own issue and start a discussion. The new issue automatically has their location attached to it. The voting system is a way to quantify how pressing an issue is. If a vote count crosses a threshold, city officials will be alerted to the matter. Thereby they can focus their attention to what their citizens need most and priortize fixing these issues. The discussion platform is our key feature. It opens a channel for direct communication between citizens and their municipal government. What we envision are actual city council members and perhaps future candidate members engaging in the discussion. Not included in our demo is a classification system we envisioned, where types of issues can be categorized. This is to filter out and only show relevant and appropriate issues to the right people. Your mayor probably doesn't take care of the garbage pickup schedule. They should be reading the large scale recommendations citizens might have. Also we believe thats its important to later include in positive comments as well, that way MPs could see what things have been done well recently to your neighborhood, and see our feedback. As for the business side of things. We see ourselves as a platform as a service. What the city gets is a platform they can host themselves, for security and privacy reasons and our support. To reiterate, City Talk would be a platform where citizens can raise a wide range of issues and open a direct dialogue with their municipal government and have engaging disucssions. As for the city, they get a valuable tool to prioritize issues their citizens are concerened with.